Nothing beats a nice 3 or 4 mile run on the beach at sunset. For me, this routine exercise takes a detour between June and September as my soul has grown accustomed to the Florida climate. I’m too much of a wimp to take the heat in the summer, so I must adjust. If the heat is too much for you while you’re here in the summer, here are some tips for enjoying the run. Start out running WITH the wind. Fight the urge to run against the wind to start. Running with the wind eases your muscles into the run to start with, and when you turn around, you will be thanking me. The gust of wind crashing into your body is an angel from heaven cooling your sweat-soaked body. Take deep breaths as young lungs can now fight through the wall of humidity and get the air it needs. Over any other tip, this one is the biggest during the summer months. Get up early, but allow the sun to do its job. It’s hot all day every day from now through September, but if you start your run too early, the radiation doesn’t have time to start the breeze on the sea. The best time to start your run is about an hour after sunrise. The breeze starts on the water, so don’t trust a feel from your room, even if your toes are on the sand. The breeze is there on the water. Get the right gear. Run in your bare feet, or some aqua socks. I’ll leave the science for someone else, but there is a big difference versus running shoes. If nothing else, running shoes will get soaked and cluttered with sand. Wear sunglasses. Wear sunscreen if you’re a ginger, else you’ll be fine early in the morning. Wear a cotton shirt if you’re a dude, the new light-weight polys are nice, but you can’t wipe your face with them. Run on packed sand. Run as close to the water as you can. If you’re in your bare feet, it’s nice to actually run right at the water’s edge to keep things cool. Powdery or soft sand can cause you to curse the beach, and that’s just ridiculous. The Mid Pinellas Piers. From the Indian Shores Pier to the Redington Beach Pier is two miles. The Redington Long Pier is about in the middle, but slightly skewed toward Redington [i.e. the leg from Indian Shores Pier to Redington Shores Pier is longer than Redington Shores Pier to Redington Beach Pier]. 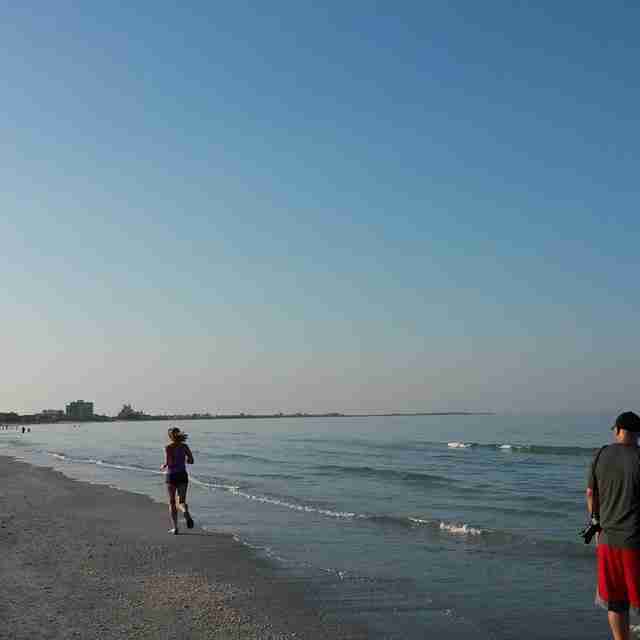 At any rate, it’s a nice run, and you can say you’ve run through four different beaches [North Redington Beach lies between Redington Shores and Redington Beach]! Get the right gear, part two. Hopefully you have a phone that has your music on it and has a nice camera. If you do the Redington run, you’ll have great sunrise pictures at the piers as well as shots of blue heron, dolphins and schools of sting rays. In early summer, near the Indian Shore Pier, nesting black skimmers will be a great spot to stop and take some pics of baby birds. Get a work out, but remember to enjoy everything the beach has to offer! Where to Run [and Park]. If you are staying on the beach, the best place to run is outside your place. If you’re not on the beach, the best places to run are in areas where parking free and plentiful. There are many places, but here are the spots that I use on my morning runs: St. Pete Beach, Upham Beach. Before 9am, you can park for free on the side streets near the Snack Shack. From Upham to the Don Cesar is about 2 miles. Pace yourself, it’s looks like the Don is a few hundred yards away, but the bowl shape plays tricks on your eyes. Treasure Island. Lots of free parking spots all day, but they aren’t marked, so you have to look around. I park on the first road, on the beach side, just over the John’s Pass bridge. There are about 10 spots; usually four or five are open in the morning. From the John’s Pass jetty to Sunset Beach is about 2 miles. Madeira Beach. John’s Pass has a bunch of free parking spots before 9am, but you have to know where to look. Directly across from John’s Pass north to Archbald Park is just over 2 miles. Redingtons. On the street. There is tons of street parking; all of it is free. Indian Shores. This is the least desirable running spot because there is very little to see on your run – same stuff over and over. However, if you like that, try parking at the Indian Shores city lot next to Mahuffers; just north of Park Blvd. Sand Key. The Sand Key lot is free and it huge, just south of the bridge, on the intracoastal side. Running from there, over the bridge to Pier 60 is about two miles. South from Sand Key on the beach is really nice too. To the new Ryan Howard mansion is just over two miles. I look forward to seeing what other runners think. Leave your comments and pictures!